We’re pleased to present a thrilling intra-New York metro area battle in the the seventh match of Parking Madness 2018. So far, the parking craters in Houston, Lansing, Providence, Greenville, and Fremont have advanced to the second round. Meanwhile, voting is still open in the Philadelphia vs. Long Beach competition. Today’s contenders prove that proximity to good transit that will whisk you to the largest concentration of jobs in America is no match for the scourge of parking craters. Take in the Hicksville vs. Jersey City action and don’t forget to vote. Hicksville, New York, is a hamlet on Long Island served by the Long Island Railroad. Not only does the rail station have an abundance of surface parking, there’s also the gigantic suburban retail parking explosion a few short blocks away, featuring the Long Island Ikea, a Target, Chipotle, and other companies whose real estate formulas dictate that they must be surrounded by parking in a place like Hicksville, train or no train. Hicksville gets about 133 trains per day and is only about 40-50 minutes away from Penn Station. Instead there is a big crater of parking. To get to a talk with Neil deGrasse Tyson I had to take the LIRR to Hicksville and take a slow bus. At Hicksville I saw nothing but parking lots. You essentially have to walk through parking lots to get out of the station. There is so much potential here, but it is waste. From the looks of things, most of that retail parking crater isn’t occupied most of the time. Behold, Jersey City: just across the Hudson River from Manhattan. And right up against its towers you have some very suburban parking lots and retail. It’s enough to make Donald Shoup cry. While it is possible that the Hicksville parking lots are due to formula retail, it’s equally possible that they are required by zoning. Big-box formula retail includes parking, to be sure, but parking is expensive enough that retailers will study demand before deciding how much to build. The result can be significantly higher or lower than the minimum required by zoning. Actually I’m not so sure if Shoup would cry regarding Jersey City. The rightmost parking lot/bigbox store in that picture is actually zoned for 5,000 apartments, with no minimum parking requirements (actually there’s a parking *maximum*). The parking lots in the middle and the right are also zoned for high-density residential or office. Technically they have crappy parking requirements, but in reality it’s easy for the developers to get around them by submitting a parking demand study. This parking crater is more a manifestation of the tastes of the 1980s than of current zoning or formula retail tastes. Within 25 years most of those parking lots will no doubt be redeveloped. From my experience growing up in the area and commuting to the city from Hicksville, there isn’t enough parking for commuters and there are no practical ways sans car to get to the station. 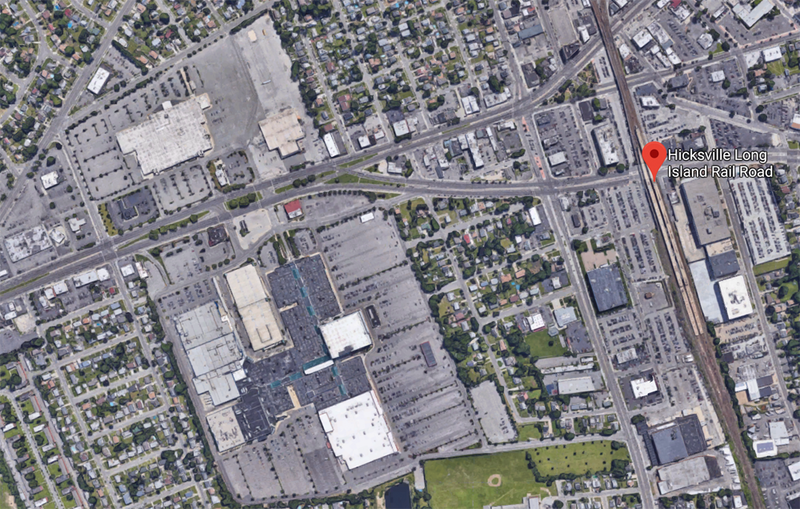 If anything, my big problem with Hicksville’s station is the lack of parking garages immediately next to the station. Instead of equal capacity and compact parking, we get surface sprawl. The parking at Newport is worse than it looks, because it was specifically built to keep out ‘undesirables’ (meaning everyone who lives in Jersey City who didn’t live in the new, shiny Newport development). I used to live by Hamilton Park, and the Newport development was designed to shut out all other Jersey City residents, forcing us to walk though multistory parking buildings to get to the PATH train. What could easily have been integrated into the local pedestrian and cycling environment was purposefully designed as an exclusive ‘high end’ community, turning its back on the rest of Jersey City. Hicksville is a huge station and a magnet for a lot of commuters who live closer to smaller stations. Last I heard there wasn’t enough parking and people have to park in the mall lot to catch the trains to NYC. To expand on the negative issues about Jersey City’s Newport Mall, it is PAID parking, and it’s not cheap. The mall has an anti-people interface towards public transportation, there being no covered or weather-protected bus loading areas. They all lie along narrow sidewalks outside the building and mostly exposed to the elements. There is no signage that tells you where specific buses load and what routes they travel. You must ask someone until you find the bus you need. The routes are relatively few, with limited covered of the city to/from the mall. For those reasons, I have not been to Newport Mall in about 20 years. It’s easier, more convenient and faster for me to get into either midtown Manhattan or the downtown financial district. The irony is, the PATH train I take to get to Manhattan goes right under Newport Mall but the station (about 200 yards of open streets away) is one of the deepest, with no you’ll find, but does not have complete handicap access. Then there is the terrible PATH service it self. The system has not had any expansion of capacity since it was built more than 100 years go. No new stations, no expanded platforms to accommodate larger trains. 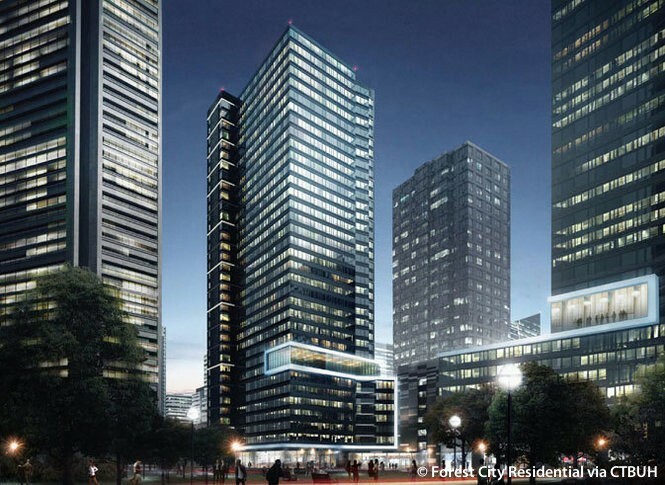 It is already over-capacity, with delays and holding by traffic controllers an common thing on virtually every trip – yet tens of thousands of new commuter apartments are under construction at stations along the route. I mean, they don’t have to, it’s purely cultural. I had a friend who lived in Hicksville, maybe two miles away from the LIRR station, and he drove a car to get there. Obviously it would be more practical just to ride a bike, and he understands this, but he drove a car there just because it’s what people do. 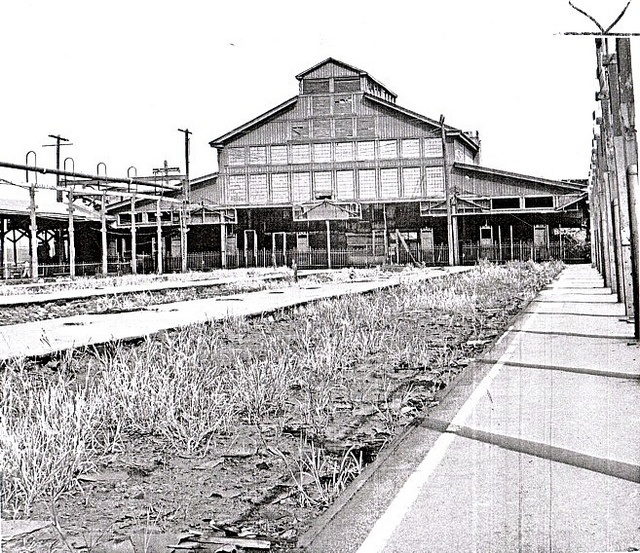 I’m pretty sure the PATH station was originally called “Erie,” because it was where you’d transfer to the Erie Railroad’s Pavonia Terminal. Some of the columns in the station still have “E” on them to designate this name. 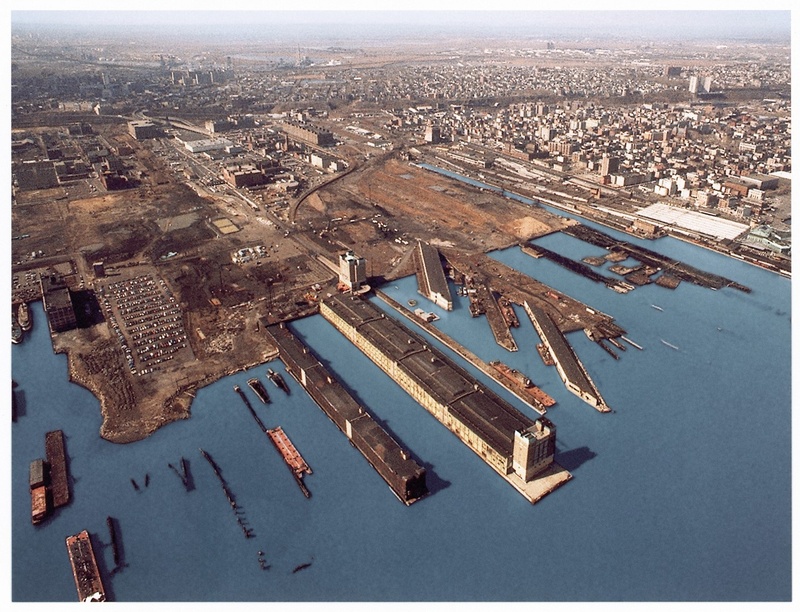 It became a dead wasteland when the Erie left. I think Le Frak was the brainchild behind Newport. I can understand why they’d agree to change the name of the station given that the neighborhood was entirely reconfigured. If you took someone from say, the 1950s, to Newport today they would have no idea where they were. I’m sure it’ll happen. The only question is how long it’ll take. While there are no plans for the Newport parking garage as of yet, the parking lot to the south of it (where the ShopRite and BJ’s are) will be turned into 9 city blocks reintegrated into the street grid, with street-level retail, apartments above, and no parking requirements. 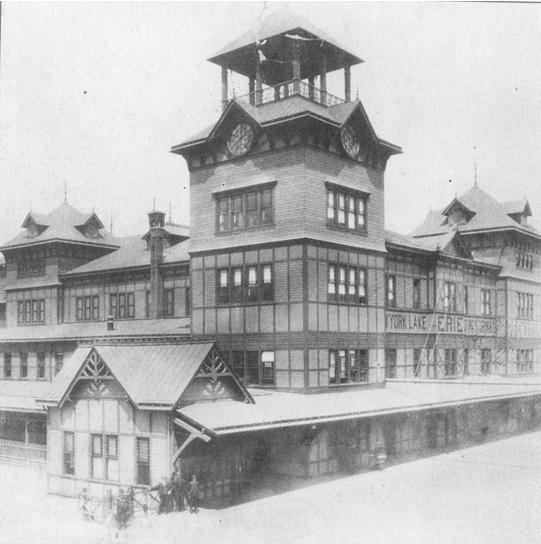 You’re both right about the name–it was variously called Erie/Pavonia or Erie Terminal station. It’s also important to note that this area never had built context to begin with, since it was a gigantic railyard for the Erie railroad with no street grid, which was abandoned in the 50’s. How quickly is PATH doing its CBTC upgrade? Think they can import some of their knowledge to the MTA? Their system seems to be basically pretty similar to the NYC subway.. wouldn’t the signalling system be similar? Not mentioned in the discussion of Jersey City is the crazy amounts of transit in that picture. 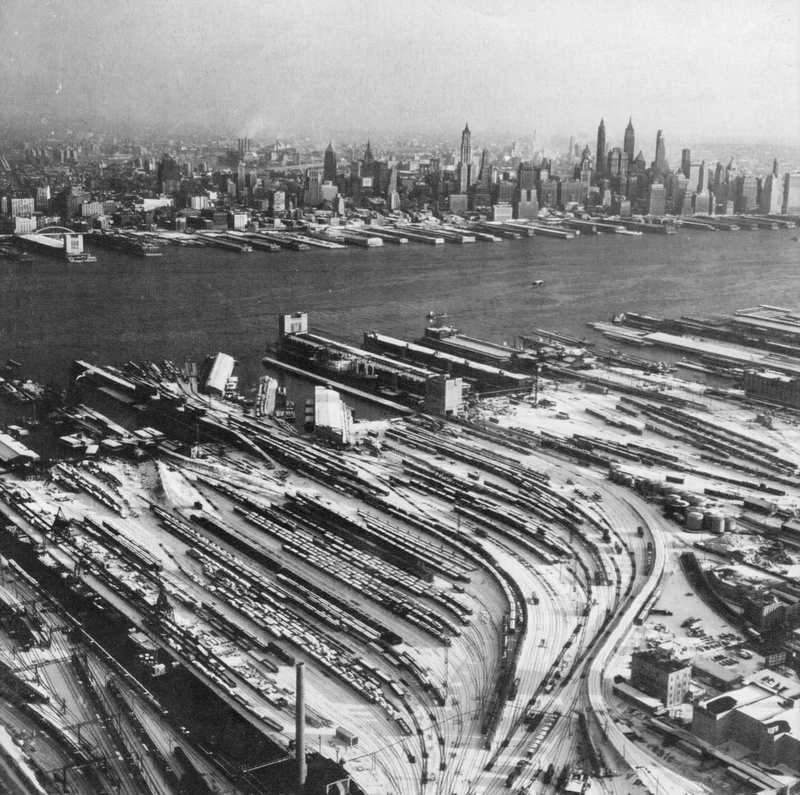 While other commenters have mentioned the Newport PATH station, there are also lots of NJT trains and another PATH station at Hoboken in the top left corner (the trainshed is in view, the historic station house is just out of view) as well as the Hudson-Bergen light rail line with stops at Hoboken and right in front of the mall. Add to it that inbound traffic going into Jersey City has been awful for years now with the construction on the Pulaski Skyway. It’s been outbound only for something like 4 years and now there’s construction on the Turnpike Extension too. Yes, PATH uses identical equipment as the IRT (1/2/3/4/5/6/7). PATH claims that they’re ahead of schedule and will finish CBTC this year. Will allow them to run a train through the tunnels every 90 seconds in each direction. Sadly the MTA is insanely insular. 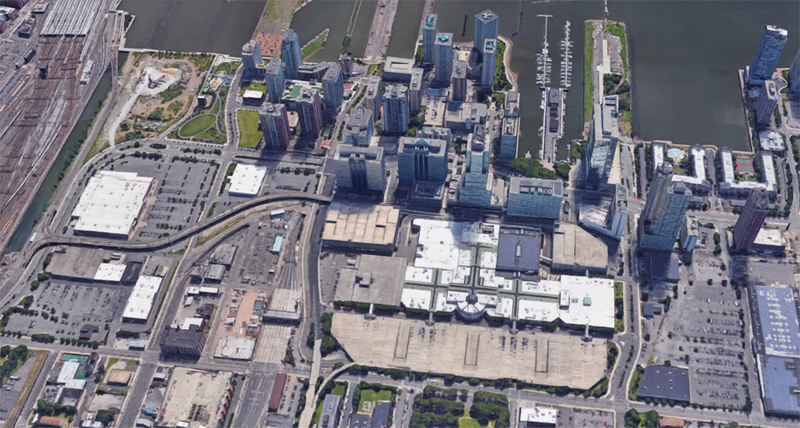 Jersey City is not so much a parking crater as a railroad crater. The infill that has taken place there over 30 years is nothing short of astonishing. In time, the 1980s parking around the mall and any remaining surface lots from the first generation of redevelopment will disappear also. How is building “a 19th century style traditional grand rail station” today considered to be within “a local building vernacular”? Vernacular architecture are buildings built without the use of a formally-educated architect, using materials common to the area and date of when it is built. Building a “19th century style” building today would hardly be using building materials common to today’s construction methods, so that can hardly be considered built in today’s vernacular architecture. And of course, the commission to design a “grand rail station” would never be given to anyone who isn’t a formally-trained architect. Yeah, it’s not. Like, in the Houston parking crater, they should just take 85% of those lots & tear them out, plat it similar to the surrounding neighborhoods and let the local builders go to work as usual. Ditto for most of the competitors in the competition. Both of these examples are really complicated, in my opinion, because the best solutions is probably not to just in-fill with the same old surrounding stuff. Both have the transportation assets to support a major job & population center. Without knowing all the details, both locations seem like they could have a major station with waiting areas, commerce, well-designed links to surface transit. Something like what we’d see in any 2-3rd tier city in Europe. The only domestic examples left seem to be the most grand from the 19th century. PATH cars are in no way identical to IRT cars. Their dimensions are vaguely similar (but not the same). The oldest PATH car in service is newer than the newest IRT car in service anywhere aside from the 7 line (which is wrapping up CBTC installation). CBTC can’t happen until the cars know how to communicate with the signal system. If you've ever wondered what's wrong with American commuter rail, take a good look at the two parking craters facing off today. Either a sorry commuter rail station in Long Island or the area surrounding the Tennessee Titans stadium is going to the championship. The winner will be bestowed with the Golden Crater, eternal shame, and, hopefully, a kick in the pants to fix its sad, sad parking crater. 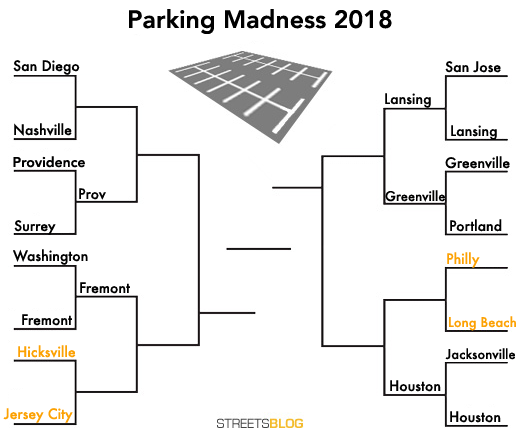 Lansing Is Your 2018 Parking Madness Champion! Only one city (per year) can emerge victorious from the Parking Madness bracket and win the Golden Crater™. Our readers have spoken, and this year that city is Lansing, Michigan.